Nike Sportswear continues their celebration of 40 years of the Nike Blazer with this all new selection of low-cut builds featuring their signature vintage detailing. The clean looks are all perfect for the upcoming spring and summer months, working with a low-cut, premium suede and white accents throughout. 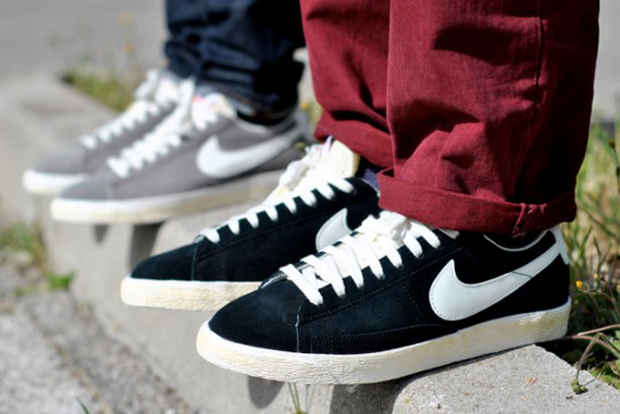 First seen is a classic red-based colorway for the Blazer Low VNTG, along with an everyday dependable black-based colorway. Completing the pack, we see a grey dominated suede build. Each pair works with a vulcanized sole down below, and Nike Sportswear's vintage detailing to bring them to life. Look for these latest colorways of the Blazer Low VNTG to release soon at select Nike Sportswear accounts soon.